Review by AllTheBestFights.com: 2018-11-03, good finish between Daniel Cormier and Derrick Lewis: it gets three stars. The former Strikeforce Hw and current Ufc light-Hw and Hw champion Daniel Cormier entered this fight with a professional mma record of 21-1-0 (67% finishing rate) and he is ranked as the No.1 heavyweight in the world. ‘DC’ suffered his only loss against Jon Jones in their first fight in 2015 (Jones vs Cormier I), since then he has won six bouts beating Volkan Oezdemir (Daniel Cormier vs Volkan Oezdemir) and Stipe Miocic in 2018 (Stipe Miocic vs Daniel Cormier). In 2017 he had also faced Jon Jones for the second time losing via KO, but then the result was overturned in a no-contest since ‘Bones’ tested positive for Turinabol (Cormier vs Jones 2). His opponent, Derrick Lewis, has an official record of 21-5-0 (90% finishing rate) and he entered as the No.3 in the same weight class. He was defeated by Mark Hunt in 2017 (Derrick Lewis vs Mark Hunt) but then, in 2018, he has won over Marcin Tybura (Derrick Lewis vs Marcin Tybura), Francis Ngannou (Francis Ngannou vs Derrick Lewis) and Alexander Volkov (Alexander Volkov vs Derrick Lewis). 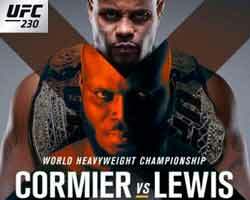 Cormier vs Lewis, main event of Ufc 230, is valid for the Ufc heavyweight title (Cormier’s first defense). Watch the video and rate this fight! Review by AllTheBestFights.com: 2018-07-07, good fight between Stipe Miocic and Daniel Cormier: it gets three stars (UFC Performance of the Night). The Ufc Hw champion Stipe Miocic entered this fight with a mma record of 18-2-0 (78% ko/tko victory rate – he has never won via submission) and he is ranked as the No.1 heavyweight in the world. He suffered his last loss when he faced Junior dos Santos in their first bout in 2014 (via unanimous decision, dos Santos vs Miocic), after this fight he has collected six victories winning the Ufc belt against Fabricio Werdum (Werdum vs Miocic) and defending it with Alistair Overeem (Miocic vs Overeem), Junior dos Santos in their second bout (Miocic vs dos Santos 2) and Francis Ngannou (Stipe Miocic vs Francis Ngannou). His opponent, the former Strikeforce Hw and current Ufc light-Hw champ Daniel Cormier, has an official record of 20-1-0 (65% finishing rate) and he entered as the No.1 light heavyweight. ‘DC’ suffered his only loss against Jon Jones in their first fight in 2015 (Jones vs Cormier I), since then he has won five bouts beating Anderson Silva in 2016 (Cormier vs Silva), Anthony Johnson in 2017 (Cormier vs Johnson 2) and Volkan Oezdemir in 2018 (Daniel Cormier vs Volkan Oezdemir). In 2017 he had also faced Jon Jones for the second time losing via KO, but then the result was overturned in a no-contest since ‘Bones’ tested positive for Turinabol (Cormier vs Jones 2). 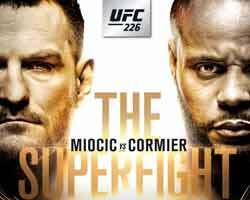 Miocic vs Cormier, main event of Ufc 226, is valid for the Ufc heavyweight title (Miocic’s fourth defense). Watch the video and rate this fight! Review by AllTheBestFights.com: 2018-01-20, good fight between Daniel Cormier and Volkan Oezdemir: it gets three stars (UFC Performance of the Night). The former Strikeforce Hw and current Ufc light-Hw champion Daniel Cormier entered this fight with a pro mma record of 19-1-0 (63% finishing rate) and he is ranked as the No.1 light heavyweight in the world. ‘DC’ suffered his only loss against Jon Jones in their first fight in 2015 (=Jones vs Cormier I), since then he has won four bouts beating Anderson Silva in 2016 (=Cormier vs Silva) and Anthony Johnson in 2017 (=Cormier vs Johnson 2). After this fight he has faced Jon Jones for the second time losing via KO, but then the result was overturned in a no-contest since ‘Bones’ tested positive for Turinabol (=Cormier vs Jones 2). His opponent, Volkan Oezdemir, has a record of 15-1-0 (80% finishing rate) and he entered as the No.6 in the same weight class. He suffered his only loss when he faced Kelly Anundson in 2014, since then he has won five bouts defeating Ovince Saint Preux (=St Preux vs Oezdemir), Misha Cirkunov (=Cirkunov vs Oezdemir) and Jimi Manuwa in 2017 (=Manuwa vs Oezdemir). 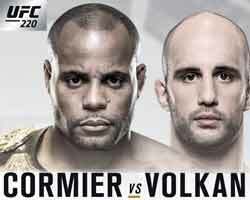 Cormier vs Oezdemir is valid for the Ufc light-heavyweight title; undercard of Stipe Miocic vs Francis Ngannou – UFC 220. Watch the video and rate this fight! Review by AllTheBestFights.com: 2017-07-29, close fight with some nice exchanges: Daniel Cormier vs Jon Jones 2 gets three stars (UFC Performance of the Night). The former Strikeforce Hw and current Ufc light-Hw champion Daniel Cormier entered this fight with a professional mma record of 19-1-0 (63% finishing rate) and he is ranked as the No.1 light heavyweight in the world. ‘DC’ suffered his only loss against Jon Jones in their first fight in 2015 (=Jones vs Cormier I), since then he has won four bouts beating Anderson Silva (=Cormier vs Silva) and Anthony Johnson in his last two (=Cormier vs Johnson 2). His opponent, the black belt in gaidojutsu and former Ufc light-Hw champion Jon Jones, has an official record of 22-1-0 (68% finishing rate) but he is not ranked as he hasn’t fought since April 23, 2016 when he defeated Ovince Saint Preux (who had replaced Cormier because ‘DC’ had injured his foot three weeks before the fight, Jones vs St Preux). Jon ‘Bones’ Jones’ only loss was, in reality, a disqualification suffered against Matt Hamill in 2009 due to multiple “12-6 elbows” (strike brought from a high position toward the floor), since then he has collected 13 consecutive victories but after fighting with Cormier he was stripped of the belt and suspended from the UFC in connection with a hit-and-run incident that he was involved in and stripped of his interim title in 2016 because he tested positive for banned substances three days before the rematch with Cormier at Ufc 200. 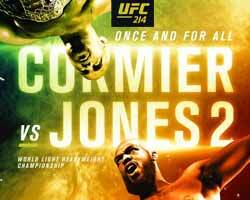 Jon Jones vs Daniel Cormier 2, main event of Ufc 214, is valid for the Ufc light heavyweight title. Watch the video and rate this fight! Review by AllTheBestFights.com: 2017-04-08, disappointing fight between Daniel Cormier and Anthony Johnson 2: it gets two stars. The former Strikeforce Hw and current Ufc light-Hw champion Daniel Cormier entered this fight with a professional mma record of 18-1-0 (61% finishing rate) and he is ranked as the No.2 light heavyweight in the world. ‘DC’ suffered his only loss against #1 Jon Jones in 2015 (=Jones vs Cormier), after this bout he won the vacant Ufc belt with Anthony Johnson in their first fight (=Johnson vs Cormier), he defended it once against Alexander Gustafsson (via split decision, Cormier vs Gustafsson) and he beat Anderson Silva (=Cormier vs Silva). His opponent, Anthony Johnson, has an official record of 22-5-0 (73% ko/tko victory rate – he has never won via submission) and he entered as the No.3 in the same weight class. After losing to Cormier in their first fight ‘Rumble’ Johnson has won over Jimi Manuwa (=Johnson vs Manuwa), Ryan Bader (=Johnson vs Bader) and Glover Teixeira (=Johnson vs Teixeira). 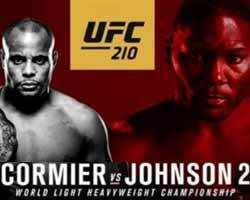 Daniel Cormier vs Anthony Johnson 2, main event of UFC 210, is valid for the Ufc light heavyweight title (Cormier’s second defense). Watch the video and rate this fight! Review by AllTheBestFights.com: 2016-07-09, we think that the fighters have entered the octagon just for the money and not to fight: Daniel Cormier vs Anderson Silva gets two stars. The former Strikeforce Hw and current Ufc light-Hw champion Daniel Cormier entered this fight with a pro record of 17-1-0 (65% finishing rate) and he is ranked as the No.2 light heavyweight in the world. ‘DC’ suffered his only loss against #1 Jon Jones last year (=Jones vs Cormier), after this bout he has won the vacant Ufc belt with Anthony Johnson (=Johnson vs Cormier) and defended it once against Alexander Gustafsson (via split decision, Cormier vs Gustafsson). His opponent, the 41-year-old (4 years older than Cormier) black belt in Bjj, judo, tae-kwon-do and former Ufc Mw champion Anderson Silva, has an official mma record of 33-7-0 (79% finishing rate) and he entered as the No.16 middleweight but his last ‘clean’ victory occurred in 2012 when he faced Stephan Bonnar (=Silva vs Bonnar). In fact ‘The Spider, after this bout, was defeated twice by Chris Weidman (=Silva vs Weidman I and Weidman vs Silva II) and he came back to win just in 2015 against Nick Diaz (=Silva vs Diaz) but the result was overturned in a no-contest after the Brazilian tested positive for drostanolone and androsterone. Then Anderson ‘The Spider’ Silva has fought once in 2016 but he has lost to current #1 Ufc Mw champion Michael Bisping (controversial decision, Silva vs Bisping). 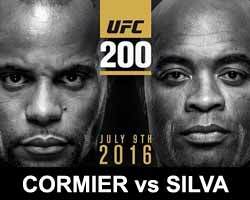 Cormier vs Silva is on the undercard of Miesha Tate vs Amanda Nunes; on the original UFC 200 fight card the main event was Jon Jones vs Daniel Cormier 2 but on June 6, 2016, ‘Bones’ was pulled from the card after potentially failing a drug test and Tate-Nunes bout was promoted as the new main event. Watch the video and rate this fight! Review by AllTheBestFights.com: 2015-10-03, great performance by both fighters: Daniel Cormier vs Alexander Gustafsson gets three stars (UFC Fight of the night). The former Strikeforce Hw champion Daniel Cormier entered this fight with a professional mma record of 16-1-0 (69% finishing rate) and he is ranked as the No.2 light heavyweight in the world. He has already fought twice in 2015 losing to #1 Jon Jones (=Jones vs Cormier ) but then he has won the vacant Ufc light-Hw belt against Anthony Johnson (=Johnson vs Cormier). His opponent, Alexander Gustafsson, has an official record of 16-3-0 (81% finishing rate) and he entered as the No.7 in the same weight class but he lost two out of his last three bouts, against Jon Jones (=Jones vs Gustafsson) and Anthony Johnson (=Gustafsson vs Johnson). Between these two fights ‘The Mauler’ won over Jimi Manuwa (=Gustafsson vs Manuwa). 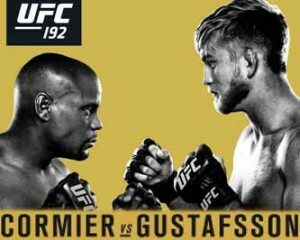 ‘DC’ Cormier vs Gustafsson, main event of UFC 192, is valid for the Ufc light heavyweight title. Watch the video and rate this fight! Review by AllTheBestFights.com: 2015-05-23, good fight between Daniel Cormier and Anthony Johnson: it gets three stars (UFC Performance of the Night). Anthony Johnson entered this fight with a professional mma record of 19-4-0 (68% ko/tko victory rate – he has never won by submission) and he is ranked as the No.2 light-heavyweight in the world (currently the #1 in this division is Jon Jones). His last defeat occurred in 2012, against Vitor Belfort (=Belfort vs Johnson), since then he has won nine consecutive bouts, but just the last three in the Ufc: against Phil Davis (who had defeated Gustafsson in 2010, Davis vs Johnson), Antonio Rogerio Nogueira (=Johnson vs Nogueira) and Alexander Gustafsson (=Gustafsson vs Johnson). His opponent, the former Olympic wrestler Daniel Cormier, has an official record of 15-1-0 (67% finishing rate) and he entered as the No.3 in the same weight class. ‘DC’ beat Patrick Cummins (=Cormier vs Cummins) and Dan Henderson in 2014 (=Henderson vs Cormier) but then he suffered his first loss in 2015 when he faced the champ Jon Jones (=Jones vs Cormier). ‘Rumble’ Johnson vs Cormier, main event of Ufc 187, is valid for the vacant UFC light heavyweight title (Jones was stripped of the belt on April 28th, 2015 for violating the Athlete Code of Conduct Policy and for his legal problems); they also faced each other a second time on April 8, 2017 (=Daniel Cormier vs Anthony Johnson 2). Watch the video and rate this fight! 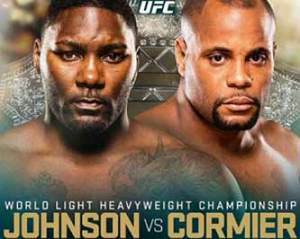 Review: 2015-01-03, pretty good fight between Jon Jones and Daniel Cormier, it was probably the only fight worth watching of a disappointing Ufc 182: it gets three stars (UFC Fight of the Night). Jon Jones entered this fight with a professional mma record of 20-1-0 (75% finishing rate) and he is ranked as the No.1 light heavyweight in the world; his only loss was, in reality, a disqualification suffered against Matt Hamill due to multiple “12-6 elbows” (strike brought from a high position toward the floor). Jon ‘Bones’ Jones is the Ufc light-Hw champion since March 19, 2011 when he defeated Mauricio ‘Shogun’ Rua (=Jones vs Rua), since then he has successfully defended the title seven times fighting just once in 2014, against Glover Teixeira (=Jones vs Teixeira). His opponent, the undefeated 35-year-old Daniel Cormier ‘DC’ (8 years older than Jones), has a perfect record of 15-0-0 (67% finishing rate) and he entered as the No.2 in the same weight class, he fought twice in 2014 beating Patrick Cummins (=Cormier vs Cummins) and Dan Henderson (=Henderson vs Cormier). 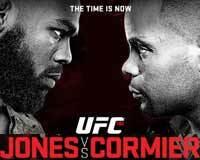 Jon ‘Bones’ Jones vs Cormier, main event of Ufc 182, is valid for the Ufc light heavyweight title (Jones’ eighth defense); they also faced each other a second time on July 29, 2017 (=Daniel Cormier vs Jon Jones 2). Watch the video and rate this fight! Review: 2014-05-24, Dan Henderson vs Daniel Cormier gets three stars only thanks to a good finish. Dan Henderson entered this fight with a pro mma record of 30-11-0 (54% finishing rate) and he is ranked as the No.4 light heavyweight in the world, he is 43 years old (8 years older than Cormier) and last year he lost three consecutive fights: against Lyoto Machida (=Machida vs Henderson), Rashad Evans (=Evans vs Henderson) and Vitor Belfort (=Belfort vs Henderson 2); he came back to victory in 2014 beating Mauricio ‘Shogun’ Rua (=Rua vs Henderson 2). His opponent, the undefeated Daniel Cormier, has a record of 14-0-0 (64% finishing rate) and he entered as the No.7 in the same weight class, he moved down in weight class to the light-Hw division just three months ago defeating Patrick Cummins (=Cormier vs Cummins); currently the #1 in this division is Jon Jones. Henderson vs Cormier is on the undercard of Renan Barao vs TJ Dillashaw – UFC 173. Watch the video and rate this fight!